Caterpillar Forest Products and Satco have signed a deal that gives Caterpillar the rights to sell and support Satco harvesting attachments and parts all over the world. Built to deal with the rough logging conditions of Australia and New Zealand, the hefty heads are built with high-grade materials. Hoses from the carrier to the head are routed through the linkage and are not exposed. This prevents damage on the hose such as over-bending, which causes premature failure. The line includes seven processing heads and two directional felling heads. The processing heads weigh a minimum of 1190 kilograms with a cutting diameter of 635 millimetres. The maximum weight is 3850 kilograms with a cutting diameter of 800 millimetres. The felling heads are continuous rotation with optimal single stem felling ranges of 305-508 millimetres to 457-762 millimetres. Debarking configurations for its products are available from Satco, along with a specifically designed processor head. 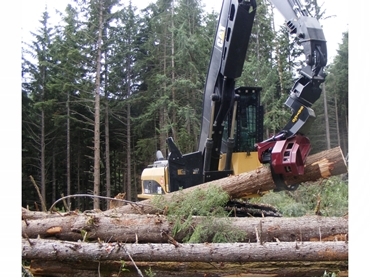 All heads are designed to be matched with Cat Forestry Machines (FMs), track feller bunchers and the Cat 501 HD harvester. The processing heads come with an easy-to-use computer system with main valves rated at 420 bar (6100 PSI) and can handle carrier pressures. Roller arm pins are 80 millimetres. The heavy duty main saw system has a 45 cc saw motor and large diameter bearing for smooth cross cutting and felling of large diameter trees. The directional felling heads are wholly hydraulic with no electronics and have the same structural strength of the processing heads. Both heads are suitable for shovel logging. The SAT420 is one head that can also be used to load trucks. They are low maintenance and an economically efficient compared to manual felling.